THE ART OF GAMING. ((( a blog mainly about board-, miniature-, roleplaying games & comics. ))): lunar park. The latest book of the author of "American Psycho" is really different to the ones written before. 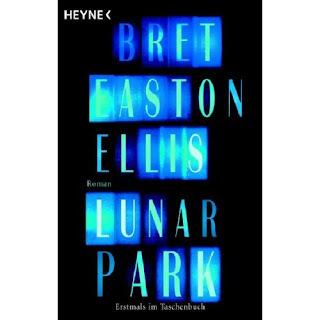 Bret Easton Ellis becomes a character in his own novel - and the boundaries between reality and fiction begin to blur more and more as the story proceeds. In this family drama Ellis raises questions of success and happiness - and what to strive for, as well as he thinks about the relationship between being a writer (or an artist in general) and a caring dad - of course all of this embedded in a horror plot. So, the outcome is an entertaining horror novel - not more, but also not less. Imagine becoming a bestselling novelist, and almost immediately famous and wealthy, while still in college, and before long seeing your insufferable father reduced to a bag of ashes in a safety-deposit box, while after American Psycho your celebrity drowns in a sea of vilification, booze, and drugs. Then imagine having a second chance ten years later, as the Bret Easton Ellis of this remarkable novel is given, with a wife, children, and suburban sobriety--only to watch this new life shatter beyond recognition in a matter of days. At a fateful Halloween party he glimpses a disturbing (fictional) character driving a car identical to his late father's, his stepdaughter's doll violently "malfunctions," and their house undergoes bizarre transformations both within and without. Connecting these aberrations to graver events--a series of grotesque murders that no longer seem random and the epidemic disappearance of boys his son’s age--Ellis struggles to defend his family against this escalating menace even as his wife, their therapists, and the police insist that his apprehensions are rooted instead in substance abuse and egomania. Lunar Park confounds one expectation after another, passing through comedy and mounting horror, both psychological and supernatural, toward an astonishing resolution--about love and loss, fathers and sons--in what is surely the most powerfully original and deeply moving novel of an extraordinary career.